Project obstacles and solutions: Zevacor Molecular produces radio-pharmaceuticals used as tracers in PET and SPECT three-dimensional scanning. They are essential to the diagnosis of serious illnesses. Zevacor produces drugs used in detecting cardiac disease and specific cancers. The cyclotron can also be used to test the effects of cosmic rays on computer chips to help increase the safety of air travel. Zevacor announced it would install the first commercial 70 MeV Cyclotron dedicated to medical use in the United States. The cyclotron compounds isotopes to produce a number of radio-pharmaceuticals used for both medical and research purposes. The 140 ton cyclotron was manufactured in Belgium and shipped to the Noblesville facility. There were two issues that needed to be addressed in this project. First, cyclotrons produce high levels of neutron and gamma radiation when in use. These have to be contained within the concrete structure surrounding the core machinery. Wall density is critical. IMI QC/QA worked with Hagerman and the site engineers to test all the aggregates and raw materials used in the concrete mix to ensure proper densities. Secondly, the facility used mass concrete. The 25,000 square foot cyclotron vault area was encased in 13,000 yards of concrete. Walls were poured up to nearly 13 feet thick. There was 300 tons of reinforcing steel and 26,000 tons of concrete used in the vault. 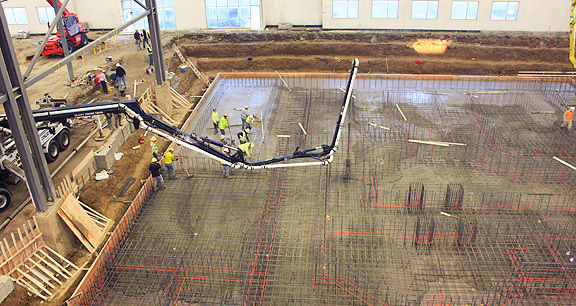 The largest deliveries of concrete required two pumps working continuously. IMI worked with R.L. McCoy Concrete Pumping and Hagerman to make sure that concrete was moving through the pump and was workable for the finishers. Core temperatures of the concrete was held in check by delivering the concrete in the cooler season or during the early morning hours. The new Zevacor Cyclotron 70P is on schedule to be operational in early 2016. For more information on concrete used for medical facilities, contact the sales representative the area nearest your location. Click here.